CANBERRA, Australia -- A showdown between Western leaders and Russian President Vladimir Putin is likely at the G20 summit in Australia starting on Saturday, following fresh reports of Russian troops pouring into eastern Ukraine. 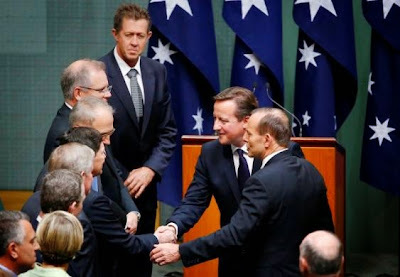 Australia's Prime Minister Tony Abbott (2nd R) introduces British Prime Minister David Cameron (3rd R) to members of his cabinet in Australia's House of Representatives chamber, after Cameron addressed a joint session of the Australian Parliament in Canberra November 14, 2014. Ukraine has accused Russia of sending soldiers and weapons to help separatist rebels in eastern Ukraine launch a new offensive in a conflict that has killed more than 4,000 people. British Prime Minister David Cameron blasted Russia's actions as unacceptable on Friday, warning that they could draw greater sanctions from the United States and the European Union. "If Russia takes a positive approach toward Ukraine's freedom and responsibility, we could see those sanctions removed, if Russia continues to make matters worse then we could see those sanctions increased, it's as simple as that," Cameron told reporters in Canberra. Russia denies sending troops and tanks into Ukraine. But increasing violence, truce violations and reports of unmarked armed convoys traveling from the direction of the Russian border have aroused fears that a shaky Sept. 5 truce could collapse. In an interview with Russian state news agency TASS, Putin said the sanctions harmed Russia, but also the global economy. He said he would not bring up the issue at G20 as "it'll make no sense". He was not asked about Ukraine in the interview. The G20 leaders summit in Brisbane is focused on boosting world growth, fireproofing the global banking system and closing tax loopholes for giant multinationals. But with much of the economic agenda agreed and a climate change deal signed last week in Beijing between the United States and China, security concerns are moving to center-stage. Ukraine has not been a top focus during a pair of summits in Asia this week, U.S. Deputy National Security Advisor Ben Rhodes said, although President Barack Obama did raise it briefly with Putin when both attended the Asia Pacific Economic Cooperation forum in China. Obama arrives in Brisbane on Saturday and will be discussing his frustration over Ukraine with a key bloc including German Chancellor Angela Merkel, French President Francois Hollande and Cameron. "They've been key toward sending a shared message to the Russians and the Ukrainian government," Rhodes told reporters. "So it will be an opportunity for him to check in with them." There had been some calls in Australia to block Putin from attending the summit given Russia's actions in Ukraine and the downing of Malaysia Airlines Flight MH17 by Russian-backed rebels, but the overwhelming consensus was against it. News reports that a convoy of Russian warships had arrived earlier this week in international waters north of Brisbane also created a flutter. Australian Prime Minister Tony Abbott said it was unusual but not unprecedented for the Russian navy to be so far south. "Let’s not forget that Russia has been much more militarily assertive in recent times," he said on Thursday. "We're seeing, regrettably, a great deal of Russian assertiveness right now in Ukraine." "Russia would be so much more attractive if it was aspiring to be a superpower for peace and freedom and prosperity, instead of trying to recreate the lost glories of Tsarism or the old Soviet Union," Abbot said on Friday. Merkel, speaking to reporters in Auckland, played down any threat posed by the warships but joined the leaders speaking out against Putin ahead of his arrival in Brisbane on Friday evening. "What is concerning me quite more is that the territorial integrity of Ukraine is being violated and that the agreement of Minsk is not followed," she said, referring to the truce accord. As host, Australia will continue pushing its growth agenda despite growing security tensions. 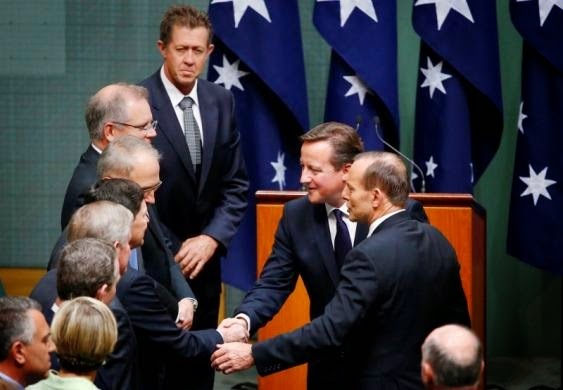 "The focus of this G20 will be on growth and jobs," Abbott said at a press conference with Cameron. Canberra is pushing for an increase in global growth targets of 2 percent by 2018 to create millions of jobs and that goal appears on track. Over 1,000 policy initiatives proposed by G20 nations should add around 2.1 percent, the head of the Paris-based Organisation for Economic Co-operation and Development (OECD) said. Taxation arrangements of global companies such as Google Inc, Apple Inc and Amazon.com Inc have become a hot political topic following media and parliamentary investigations into how many companies reduce their tax bills. The OECD has unveiled a series of measures that could stop companies from employing many commonly used practices to shift profits into low-tax centers. Australian Treasurer Joe Hockey said Australia had won U.S. cooperation to launch an "aggressive crackdown" on tax avoidance. In the world where law serves common people and protect individual from abuse, person who did not commit crime himself but trained the criminal, provided safe house for him, gave him weapon to commit crime, such person becomes liable, gets prosecuted and usually serves the time in specially designed institution. When Russia tells the world we did not send our military to Ukraine it is hypocritical and criminally liable.